This year, I discovered just how delicious blending mushrooms into meat was. I guess you can say that I am officially a blenditarian! Blend•i•tar•i•an – / ,blend-ǝ-‘ter-ē- ǝn / noun / one who believes that the mighty, meaty mushroom makes meals more delicious, nutritious and sustainable! 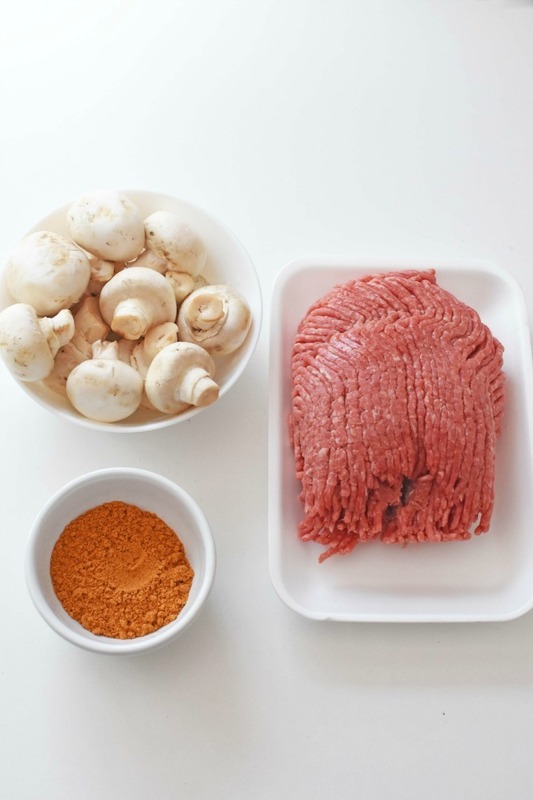 I love how tasty, flavorful, and hearty blending mushrooms and meat together truly is! You see, my kids are so picky and will not eat poor little mushrooms by themselves, BUT when I blend mushrooms into meals like Cheese Stuffed Meatballs, and Tacos–they have NO idea! They happily gobble it up and typically request seconds. Yesterday, I made these Mushroom & Meat Nachos Supreme Recipe and guess what? They raved about how yummy they were. I definitely don’t want to ruin my little blenditarian secret so I did not tell them that they were eating 1 part meat, 1 part ground mushrooms! These Mushroom & Meat Nachos Supreme were such a treat! I had to make two batches: one for Jared and I, and one for the kids. But, it was so EASY! I actually prepped the mushroom and meat mixture in the morning, pan-fried it with one packet of taco seasoning, and then popped it into the fridge. Allowing the flavors to meld all day really worked to my benefit too! When dinner time strolled around, we had such thick, hearty meat to add to our veggie and cheese topped nachos! What a score! Of course, this meat also is what you could stuff tacos or burritos with too! The avocado, fresh tomato, green onion, cheese, sour cream and meat blend came together so well. 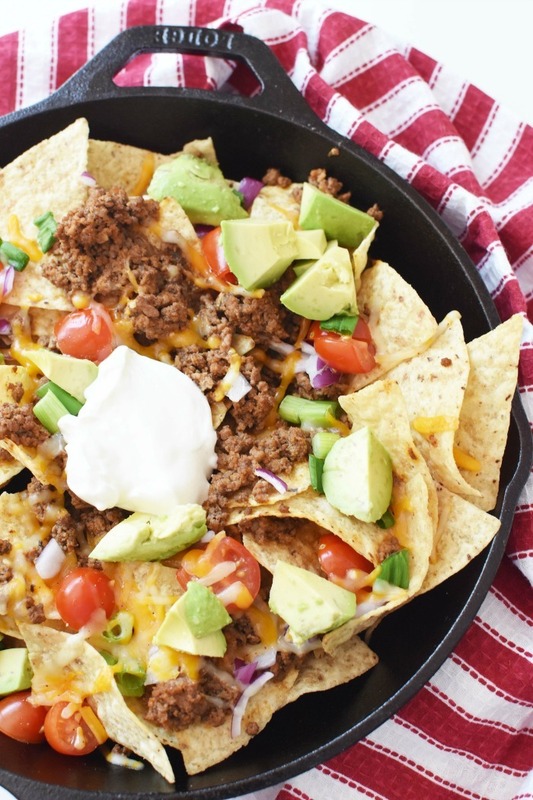 This Mushroom & Meat Nachos Supreme Recipe is one that I want, and need to recreate again soon! 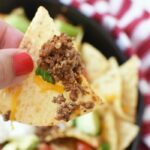 If you love meat nachos, try these blended mushroom and meat nachos and you will also be a blenditarian! A flavorful blend of white mushrooms, hamburger meat and taco spice atop a bed of corn tortillas and fresh veggies. 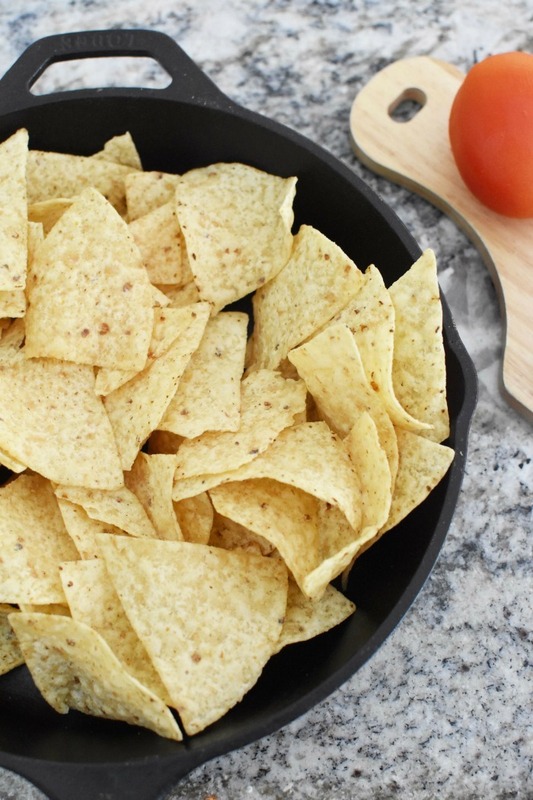 These nachos are finished with some cheese and sour cream for a hearty, quick meal. 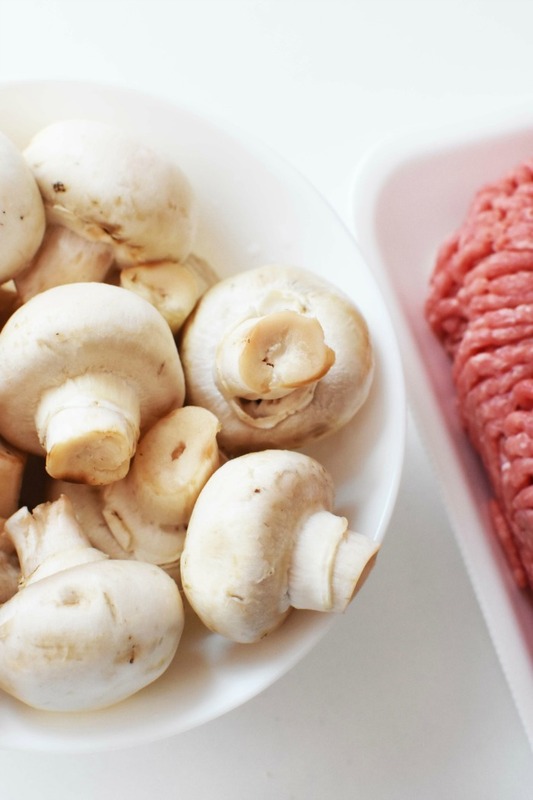 Wash & blend mushrooms in a food processor until pureed. 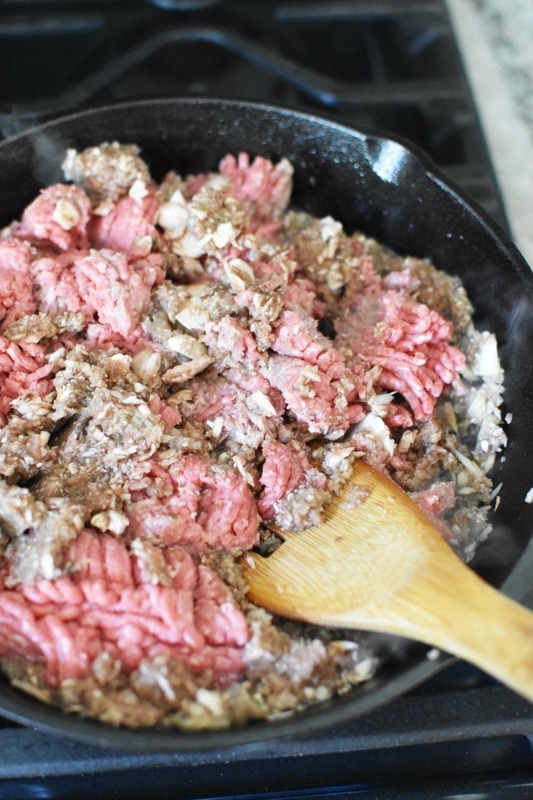 Add the meat & ground mushrooms to a skillet. Cook until meat is fully browned. Add in taco seasoning packet - there should be enough moisture in it pan to combine the spice. 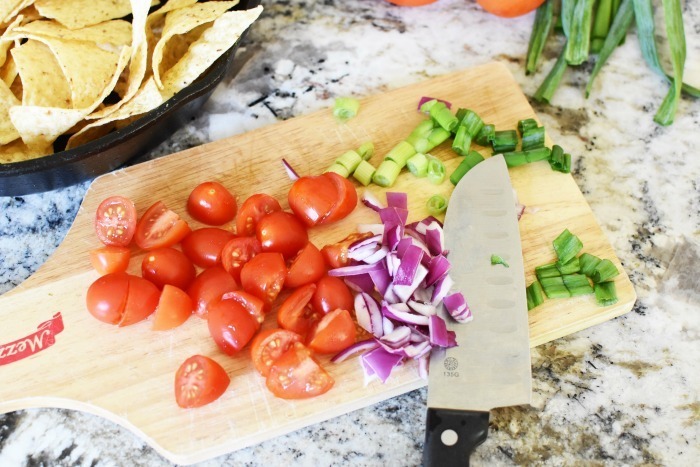 Arrange tortilla chips in a skillet Top with veggies, meat, and cheese. Bake at 350 for 5 minutes until cheese is melted. Enjoy! Yes! Now THOSE are what I call nachos! Those look super delicious. I can’t wait to make them. 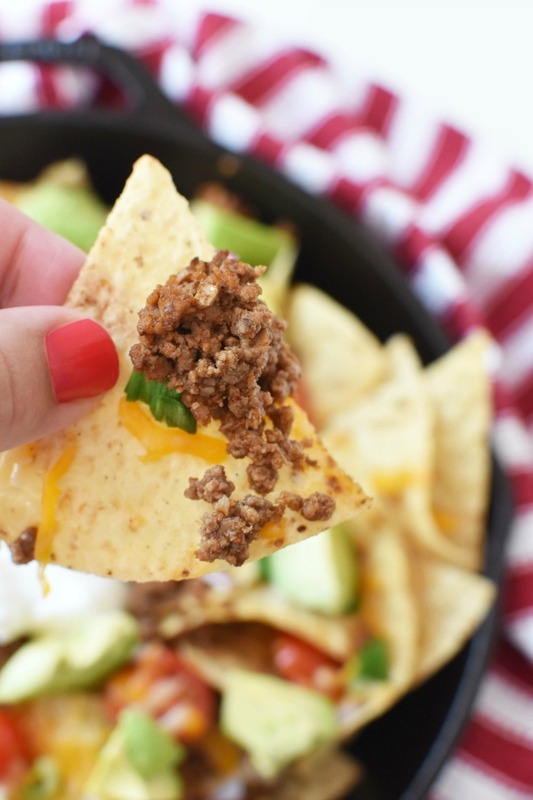 This is one of the best nachos recipes I’ve seen! I may have to request these for Father’s Day! Yum this looks so delicious. I haven’t had nachos in a very long time, would love to change it up and have some of these! This is a genius tip to get those mushrooms in there without anyone knowing! I think mushrooms have a meaty taste anyway so if you can see them you wouldn’t know they are there. Love this recipe. I never thought to add mushrooms to a supreme nacho recipe. What a brilliant addition. I am surely going to give this recipe idea a try, my tummy was growing just checking out the scrumptious photos! I never would have thought to put mushrooms on nachos- even though I love mushrooms. I’ll have to give this a try. I love blending mushrooms into meat. It adds a lot of texture in my opinion and you get the health benefits of mushrooms! I love Nachos, but Nachos Supreme look and sound amazing! I would definitely be all over eating a plate of these! This would be a great dish to put out if all my kids were visiting. They all love a good nacho recipe. We love mushrooms! So many people have such a negative mindset about them, but they’re so versatile and delicious! 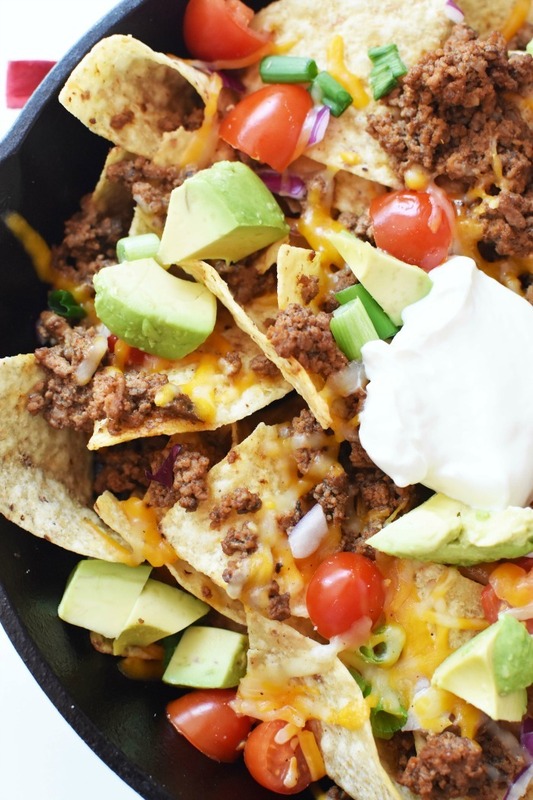 I am so trying these nachos! Nachos are so delicious! 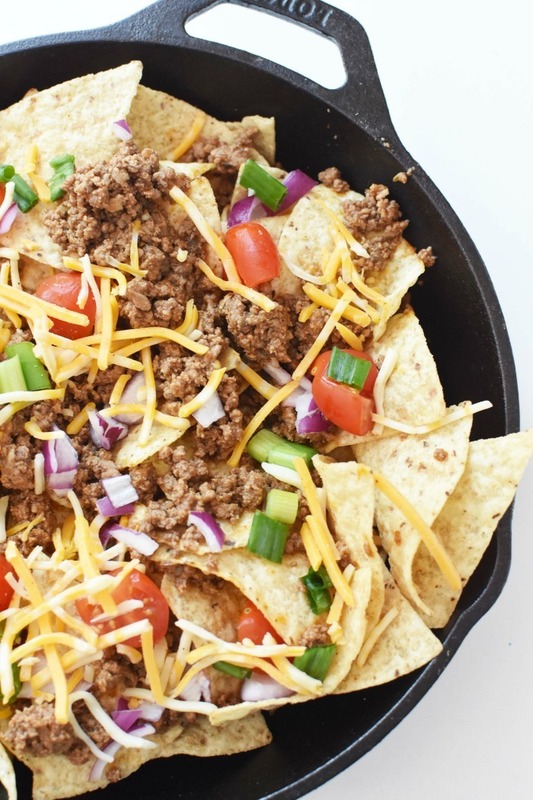 We try to have a nacho night once a month, and the whole family looks forward to it. Yum these nachos look delicious! I am so making this for our house. My kids and husband would love! Love your recipe! Tonight is taco night! I can’t wait to try it! I will be honest I am not the biggest mushroom fan. I have plenty of friends who are never thought it can be used in nachos.